Ladies and gentlemen, I was told this by high level sources and it was evident and especially after Reagan was shot in his first year in office when he was acting like Trump, and doing the right things, that he never really recovered. They gave him cold blood, and his transfusion that causes brain damage. They slowly gave him small amounts of sedatives. It’s known that most presidents end up getting drugged. Small dosages of sedatives till they build it up, Trump’s such a bull he hasn’t fully understood it yet. Why post something from a fella playing a character? Alex Jones is has created a fictional character and is just an actor playing a part. Diet Cokes and iced teas alone could do it. Ask Rummy about aspartame.... Trump should stick to water and fermented beverages. this would be easier to believe if trump ever did anything good. he hasn't, so har do tell if anything here makes any sense. 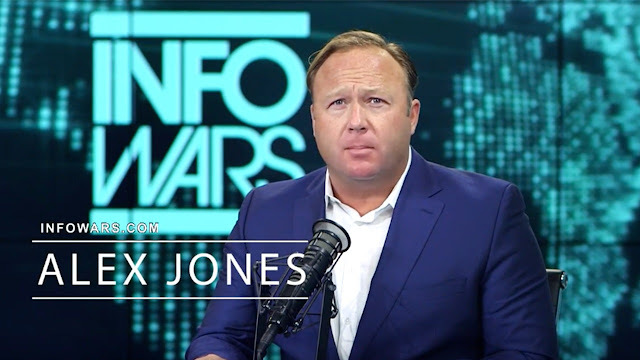 The Alex Jones Show is a show devoted to the presentation of Alex Jones. Out of each hour, 40 minutes is devoted to ads, 17 minutes to Alex Jones's mood and feelings, and 3 to substance, much of which is nonsense. He may be a mainstream operative tasked with making libertarians look bad.